Pep Guardiola’s Bayern Munich continued their perfect start to the Bundesliga season with a 1-0 away win at Eintracht Frankfurt on Saturday. 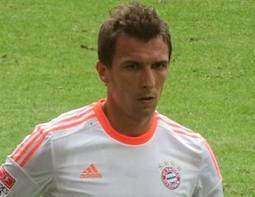 Victory came courtesy of Croatian striker Mario Mandzukic whose 13th minute volley was enough to earn Bayern all three points. Last season’s treble winners have now gone 27 league games without defeat and will break their club record if they can get a result against Nurnberg at the Allianz Arena next weekend. “We had much more control over the game compared to last week,” Guardiola said after the match. “We allowed Gladbach (who Bayern beat 3-1 on the opening say of the season) far too many chances on the break, but it was much better today,” he added. Bayern are level on points and goal difference with Bayer Leverkusen who beat Stuttgart 1-0 at the Mercedes Benz Arena — a Daniel Schwaab own goal three minutes before halftime proving the difference between the two sides. Mainz and Werder Bremen also made it two wins out of two. Mainz beat Freiburg 2-1 while Werder edged past Augsburg 1-0. Hoffenheim recorded a resounding 5-1 win away at Hamburg to move up to fifth in the table. Wolfsburg bounced back from an opening day 2-0 defeat to Hannover with a thumping 4-0 win over Schalke while Hannover fortunes were reversed as they crashed to 3-0 defeat at Borussia Monchengladbach. Hertha Berlin travel to Nurnberg on Sunday while Borussia Dortmund entertain Braunschweig. Meanwhile in Spain, La Liga kicked off on Saturday with Real Sociedad running out 2-0 winners at Getafe. Mexican striker Carlos Vela opened the scoring in the 42nd minute before Swiss international added a second 20 minutes from the end. Athletic Bilbao also bagged three points on Saturday beating Valladolid 2-1 thanks to goals in either half from Markel Susaeta and Iker Muniain. Spanish giants Barcelona and Real Madrid kick off their league campaigns on Sunday. Barcelona, under the stewardship of new coach Gerardo Martino, will play Levante at the Nou Camp while Carlo Ancelotti’s Real Madrid entertain Real Betis.